On busy Bangalore roads at night, the greatest caution may not avert accidents. But T. Raja is not focused on his driving. Oblivious of the speeding vehicles, his eyes dart around surveying garbage bins and road dividers. They finally zoom in on a pack of stray dogs around an overflowing bin outside a marriage hall. Raja notices a figure in tattered clothes fighting with the canines for leftovers. The battle for food lost, the trembling figure retreats to the background. Parking his bike, Raja lifts the 'tattered bundle of clothes', and peers at the de-humanised face. The hair is matted, the eyes are barely open and fly-infested sores cover the body. The stench of garbage, urine and excreta hits Raja in the face. "Father, father," Raja calls out to the old man, who moans in response. Raja strains his ear. "Food," the man whispers. Raja gets a few buns from a bakery but the old man barely has the strength to eat. After taking a few sips of water, he slips into slumber. Raja telephones a friend and asks for an autorickshaw in which they shift the old man to a room on the outskirts of Bangalore. They set him on an old wheelchair to cut his hair and shave his beard, scrub his body and cover him with clean clothes. He sleeps again, blissfully unaware of 18 others in the room. This is Raja's New Ark Mission of India, a single-room home for the abandoned. Each of the 18 people in that house has a story to tell. Only, the stories are similar: life on the streets, starvation, near-death and, then, Raja. The good Samaritan himself was a street urchin. "I know how it feels to live with dogs and fight for leftovers," he says with a smile. The son of a telephone linesman never knew parental love and Raja took to stealing, drinking and gambling early in life. He ran away from home and lived on the streets for two years. Then he decided to stop begging and start working. "I drove autorickshaws for some time and then, taxis," he says. "I worked also as a bodyguard and hitman in the auto union. After a while I was fed up with that kind of life." He knew he had better things to do in life. Even while driving autorickshaws, Raja worried about the homeless and hungry. "Without exception, the first word they say is 'food'," he says. Somewhere along the line, his father's attitude also changed. The bike Raja drives is a gift from him. 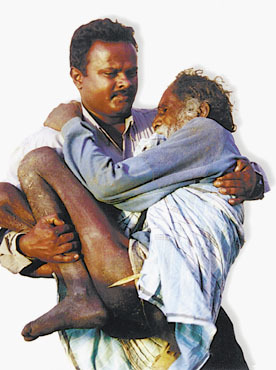 Many in the destitute home died in Raja's arms. Others, he introduced to simple jobs like gardening. The oldest inmate is Mariya Joseph, 101, who sings devotional songs. "When I met him a year ago, he was a wandering singer," says Raja. The youngest inmate came eight months ago as a toddler with a deformed eye. As Raja did not know her name, he called her Grace. She is the apple of his eye. "My wife says I love Grace more than my own two daughters," he says. He believes that Grace will one day be like Mother Teresa. Kanthi (named changed), in her mid-20s, is mentally challenged. Living on mean streets, she was raped countless times. She had a festering wound on her back when Raja found her. "The doctors removed 200 maggots from that wound," says Raja. Kanthi now helps in the community kitchen. Raja's home for the destitute costs him more than Rs 7,000 a month. "Our main problem is medical care," he says. "Even government hospitals demand money." The India Campus Crusade for Christ contributes Rs 5,000 every month, and Raja raises the balance from his friends and shop-keepers. Cash or kind, every paisa is accounted for. Campus Crusade is planning to gift a new residence to Raja and his wards on a half-acre plot at Dodda Gubbi, a far-flung outpost of Bangalore. The Sneham Trust of Bangalore has promised six cows and help in raising funds for a small business venture. Butcher Mathew Albin of Alappuzha, Kerala, was such a terror that people called him Irachi (flesh) in hushed tones. Killing people came easily to Irachi Albin. Mutilating bodies was easier still. He even washed his hands in the blood of his victims. At the time of his arrest in the early eighties, Albin had five murder cases against him and a hundred other cases. He got a lifer in 1983. In jail he was given to introspection. "I became aware of the life I wasted till then," says Albin. "I experienced Christ's great love and vowed that I would serve a good cause after my release." In 1997, three years after his release, he rented a small house for the destitute in Alappuzha with the wages he had earned as a jailbird. All 17 inmates were mentally ill. Three months later, the landlord asked Albin to vacate the house: he was afraid of stigma and material damage to the house. With great difficulty, Albin found a person who was willing to rent out a building, an abandoned factory at Punnapra, but he wanted Rs 5,000 as security deposit. Albin had no one to turn to but miraculously he received three money orders, totalling exactly Rs 5,000. Thus was born the Sarvodaya Shanti Bhavan Charitable Trust, which today has 200 inmates. Other miracles have happened: Albin says 70 patients have returned to normal life. "Love is the greatest medicine one can give them," he says. Shanti Bhavan survives on donations. "We live a life of uncertainty," says Albin. "We have no idea how we will survive tomorrow. But somehow, at the last minute, our prayers will be answered and someone will come forward to help." Albin and his family live in a corner of the building. His three children and wife, Mary, mingle freely with the inmates, attending to their every need. Like Raja, Albin had a wretched childhood. Born in a poor fishermen family in coastal Cherthala, Albin was brought up by his mother after his father was murdered by fellow fishermen. At 13, Albin ran away from home, and then worked as a caretaker of terminally ill people. He returned home eight years later, married Mary against her parents' wishes, and found a job in a local company. Albin's life changed the day his brother died in mysterious circumstances. The police laughed off his complaint of foul play and he decided to take the law into his own hands. "I got only raw deals all the time," Albin recalls. "When I tried to reform myself, I was pushed deeper into crime." He became a formidable goon who worked as a butcher, a job that made him even more fearsome. He killed without compunction. "My victims included policemen, other goons and even a journalist," he says. Finally, it was a mob that felled him. Local people united against him and brutalised him. He was swathed in bandages when the police arrested him from hospital. Albin has put the past behind him. The hand that wielded a machete is today counting beads and soothing wounded minds.